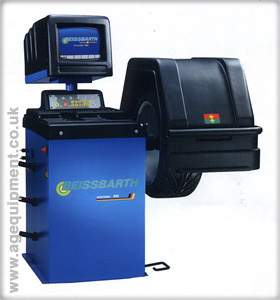 Model 860: Automatic measurement sequence with final wheel braking. Monitor display of imbalance values. Electronic sensing arms for automatic rim data recording. Seven balancing methods with five alloy wheel programs and special programs for concealed attachment of adhesive weights. Alloy wheel alignment gauge for concealed attachment of adhesive weights. Matching program. Wheel sizes up to 20". Wheel weights up to 70 kg.